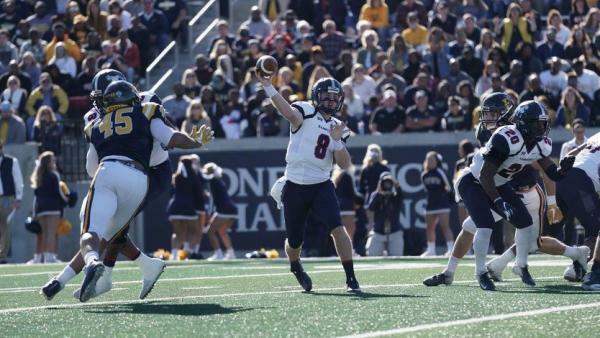 Samford quarterback Devlin Hodges finishes his career as the all-time leading passer in NCAA Division I FCS history, breaking Steve McNair's famed mark to end with 14,584 total yards. Samford quarterback Devlin Hodges finishes his career as the all-time leading passer in NCAA Division I FCS history, breaking Steve McNair's famed mark to end with 14,584 total yards. Hodges set the new standard in his final game, going 40-of-53 for 404 yards in, fittingly, leading his team to a 38-27 triumph over East Tennessee State. The victory secured another winning season for the Bulldogs, while the record only adds to Hodges' legacy as one of college football's most-accomplished quarterbacks ever. Moving just 30 miles from Mortimer-Jordan High School in Kimberly, Alabama to nearby Samford University in Homewood, here is how Hodges skyrocketed all of the way to the top: 2,230 passing yards as a freshman, 4,088 as a sophomore, 3,983 as a junior and now 4,283 as a senior. His recent year-long tally stands as a new Southern Conference mark. Hodges, who threw for 475 yards at Florida State back in September, finished this fall on a truly remarkable run, throwing for 562 yards, 473, 402, 399, 404 and 404 more over his last six games. The iconic record officially became his when Hodges threw a 7-yard screen pass to DeMarcus Ware on the final play of the third quarter. Later that drive, Hodges gave Samford its first lead of the day, a score that would ultimately prove to be the game-winner. In a contest where the spotlight was on his passing production, Hodges willed the Bulldogs to victory both throwing and running the football. He passed for over 400 yards, but rushed for a career-high three touchdowns, the aformentioned fourth quarter score included. Hodges like countless games before, added to the media guide while setting a new status quo; he leaves Samford with 27 victories in four years, two playoff appearances and too many program, league and national records to count. Hodges walked off the field on Saturday a legend, with the most passing yards of any player in FCS history. He also walked off the field a winner. For all of the numbers, the end result, for Hodges, is an impact beyond measure.